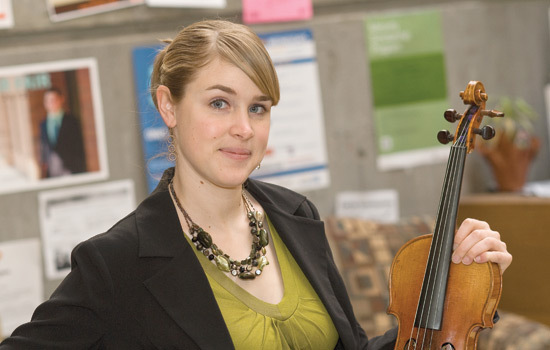 MBA accounting major Adena Thomson enjoys playing the violin during her spare time. Violin music can pull at the heartstrings, and so does Adena Thomson when you first hear her story. There’s a sense of stoic resilience in this MBA accounting major in the E. Philip Saunders College of Business who says in her lifetime she moved 16 times before coming to RIT. Her strongest memory and the turning point of her life happened in November 2005. Born in Farmington, Pa., she is the second eldest of five children—raised by parents who follow a rural way of life in a Christian religious community similar to Amish and Mennonite sects. Shunned from the commune because of her desire for freedom, Thomson found herself entirely alone at the age of 17. “I had no car, no computer, no money and no idea of what I was going to do with my life,” Thomson says. She started working in Skaneateles as a housekeeper and cook at the Stella Maris Retreat Center—where the nuns proved to be a real godsend when they learned about the one treasured possession she had to leave behind. While juggling several jobs, Thomson completed her GED diploma and then graduated with an associate degree from Onondaga Community College before moving to Rochester and earning her bachelor’s degree in business administration from RIT last February. “At RIT, I’ve met peers who will be my friends for life, who share in both my struggles and accomplishments in spite of our diverse roots,” Thomson says. Thomson has maintained a 4.0 GPA throughout her entire education but says the Saunders MBA program is “definitely more of a challenge.” Her career goal is to become a certified public accountant. She is a member of Phi Theta Kappa and Beta Gamma Sigma International Honor Societies and was awarded prestigious scholarships from the New York State Society of Certified Public Accountants and the Turnaround Management Association Upstate New York Chapter Scholarship. Thomson rarely sits still; she works as an accounting and finance tutor in the Saunders College and is the financial administrator in the Center for Detectors at RIT. She also is the team captain of an RIT intramural volleyball team, plays tennis and racquetball “for fun,” and performs as a violinist—most recently with the RIT Orchestra during the 2010-2011 winter season.